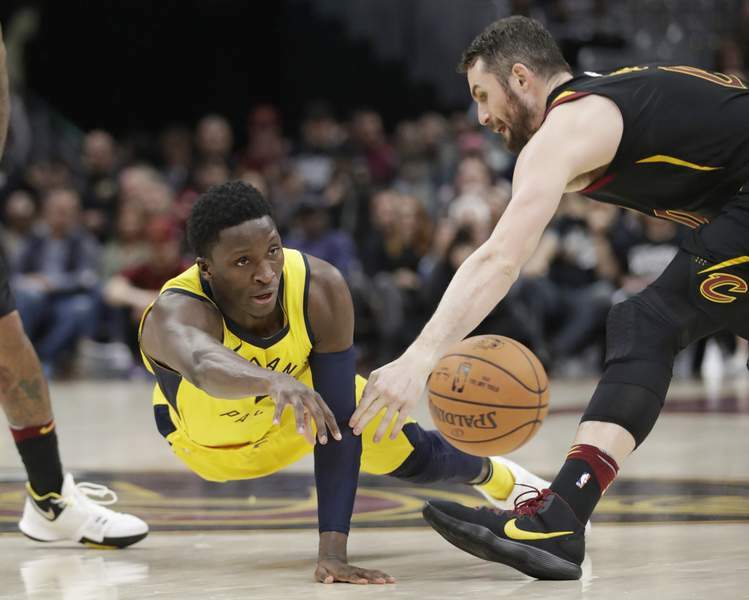 Associated Press Pacers guard Victor Oladipo scored 32 points in Sunday's Game 1 victory over the Cavaliers in Cleveland. Game 2 is Wednesday. CLEVELAND – They've spent the season on the fringe, virtually ignored by all but the most savvy fans and NBA insiders. They don't have any household names or any superstars, just one All-Star and a role player best known for foolish on-court antics. But as the Indiana Pacers strolled quietly into practice Monday at Quicken Loans Arena, a building they silenced less than 24 hours earlier with an eye-catching playoff win in Game 1 over the Cavaliers, there was something unmistakable about them. They're confident – and they're no longer a secret. The Pacers were the better team – by far – Sunday, leading from tip to final horn in a 98-80 victory. But the lack of attention doesn't faze the Pacers. It fuels them. “We've been playing like this all year,” said Oladipo, the team's rising star who has been on a mission since coming over from Oklahoma City in the deal for George. “Been playing hard on both ends all year. It just hasn't been magnified. So it's the playoffs now, we've been doing this all year. Now everybody sees.”Young, who along with Myles Turner are the only starters from last year's playoff squad, said Indiana's success is rooted in the team's togetherness. A year ago, the Pacers were going in different directions. “We had a lot of guys with egos that we really couldn't push aside” he said. “And there was a lot of miscommunication and a lot of different things that were going on. We didn't know if Paul was going to be here. We didn't know if Jeff (Teague) was going to stick around. There was a lot of uncertainty and no clarity from Day One and that hurt us from being a better team than we could've been.